Irish Athletic Third-level Boxing Association | Promotion & Development of AIBA Open Boxing (AOB) at Ireland's Third-level Education Institutions. John Marshall (DCU) silver medallist, Eddie Cummins, referee, and Bryan McNamee (LYIT) gold medallist, after their Senior 75Kg final bout. The IATBA Championships concluded on Sunday March 10th at the National Stadium Dublin after four days of top quality boxing. GMIT emerged as the most successful team in the championships with six IATBA titles, followed by UCC and UL with five titles each. DCU, whom had been the top team each time in the past number of years, finished with four titles won. With over 170 entries, these third-level championships cater for all class ranges, where boxers can participate to represent their third level institution from complete beginner up to elite class standard. Three current IABA Elite Champions entered – Regan Buckley (Bray IFE), Patryk Adamus (NCI) and Thomas O’Toole (GMIT). Saturday and Sunday, March 2nd and 3rd, saw the action get underway and some contests were in the balance up to the final bell. Justin Tang (CIT) edged William O’Connor (NUIG) on a 2-1 split decision in the Junior Novice 72KG division. Kevin Beirne (UL) also took a 2-1 split decision over Eoin O’Connor (MU) in another very close contest in the Junior Novice 75KG division. Conor Glackin (NUIG) also had to wait until the final bell to be sure of his win in another excellent contest with Declan Garvey (TCD). Glackin took it 2-1 to progress in the Junior Novice 75KG division. Harry Walsh (DCU) edged Luke Burke (WIT) on a 2-1 split decision to book his semi final spot and it all came down to the last round as both boxers were level going into it. On another day, Burke could have taken it but the difference between these boxers was minimal. There is definitely the making of a rematch somewhere down the line with these two! The Senior 63KG division threw up a classic when Sean Gallagher (TCD) got matched with Terry McEntee (DCU). After three quality rounds of boxing by both boxers, McEntee’s quantity of punching and supreme fitness levels came to the fore as he took the contest by a unanimous decision. This bout was followed by another top quality contest where Edgar Vuskans (QUB) took a 2-1 decision over Daryl Clarke (UU) in the Senior 69KG division. The result of this bout hung on the result of the last round and Vuskans had enough energy left in the tank to take it on all the judges scorecards. In the Senior 75KG division, Bryan McNamee (LYIT) took a unanimous decision over Airijus Vitlipas (NCI) in another top quality bout between two very experienced boxers. The semi-finals saw Mary Kate Slattery (TCD) take a 2-1 split decision over Mai Nguyen (TU Dublin) in the Female Intermediate 57KG division. This contest was decided in the final round as both boxers were level after the first two rounds and Slattery got the nod in the last. In the Junior Novice 60KG semi-final, Donagh Egan (UCD) took a unanimous decision over Dean McMahon (MU). In the Junior Novice 69KG division, Beniamin Olar (CIT) took a unanimous decision over Michael Treanor (ITC). In the Junior Novice 72KG semi-final, Sean Owens took a split decision over Niall English in the all University of Limerick battle. Sean McDonnell (UCD) took a unanimous decision over Justin Tang (CIT) in the corresponding semi-final. In the Junior Novice 75KG semi-final, Brian O’Leary (UCC) beat Kevin Beirne (UL) on a unanimous decision while Harry Walsh (DCU) beat Conor Glackin (NUIG) 2-1 on the other side of the draw. The Junior Novice 91+KG semis saw Israel Akinniranye (DCU) win on a unanimous decision over Daniel Clarke (NUIG). Samuel Ilesanmi (TU Dublin) took a unanimous decision over Eithan Ntibimenya (MU). In the Senior Novice 63KG semi-final, Gavin Bradshaw (ICFE) beat Alfred Ololabi (TU Dublin) after the contest was abandoned before round three. The Senior Novice 75KG semi-final saw Jean Pierre Kaluena take a unanimous decision over Zana Palani (TU Dublin) while Conor McGinn (DCU) took a unanimous decision over Ruaidhri O’Conaill (UL) in the corresponding semi-final. In the Intermediate 69KG division, Mikey Keating (WIT) took a 2-1 split over Colm Conneely (NUIG) and again this contest went down to the wire before Keating had his hand raised. In the second Intermediate 69KG semi-final, Kieran McCole (DCU) took a unanimous decision over Jordan Hamilton (BMC) but only after taking the final round on all the judges scorecards. In the Intermediate 81KG semi-final, Harrison Eghosa Igharo (DKIT) took a unanimous decision over Matthew Doherty (ITS). In the Senior 75KG division semi-finals, Bryan McNameee (LYIT) took a unanimous decision over Peter Fabian (TU Dublin) while John Marshall (DCU) took a 2-1 split decision over James Gerard McDonagh (GMIT). The finals were every bit as exciting as the earlier sessions and in the female novice 57KG final, Dearbhla Snow (UCC) took home the gold after a unanimous decision over Áine McKee (QUB). In the Novice 60KG final, Lauryn Walsh (UCC) showed her class as she overcame Kylie O’Donoghue (UL) by unanimous decision to make it a one two for UCC. Rachel Buchanan (GMIT) got the upper hand on city rival Aisling Parra Haren (NUIG) to take a unanimous decision and the 66KG Novice title. James Moone kept the UCC flag flying when he took a 2-1 split decision win over Donagh Egan (UCD) to claim the Junior Novice 60KG title. In the Junior Novice 63KG final, Darren O’Connor (NUIG) took a unanimous decision over Jamiu Adio (TU Dublin). In the Junior Novice 66KG final, Owen Doyle (MU) stopped his opponent John Dunne (UL) in the third round to claim the title. Danny Maguire (DCU) took a 2-1 split decision win over Beniamin Olar (CIT) in the Junior Novice 69KG final. This contest went right down to the wire with everything evenly poised up to the final bell where eventually, Maguire got the nod. The Junior Novice 72KG final saw Sean McDonnell (UCD) take a unanimous decision over Sean Owens (UL) to claim the title and Brian O’Leary (UCC) did likewise in the Junior Novice 75KG final with a unanimous win over Harry Walsh (DCU). The Junior Novice 78KG final saw Cian Fitzgerald Bradley (UL) take a unanimous decision over Stephen Lee (CIT) while in the Junior Novice 86KG final, Paul Buckley (UCC) got the unanimous decision win over Michael Conlan (SWRC). The Junior Novice 91+KG title was won by Samuel Ilesanmi (TU Dublin) following a unanimous decision over Israel Akinniranye (DCU). The Senior Novice 60KG final was an excellent tussle between Adam Kiely (WIT) and MacDara O’Morain (UCD). With little between the boxers in a hard-hitting contest, Kiely took the verdict on a 2-1 split decision to claim the title. The Senior Noovice 63KG final followed with Gavin Bradshaw (ICFE) having the better of the bout against Gerard Hughes (BMC) to claim a unanimous decision. The Senior Novice 66KG final was an all TU Dublin affair between Jean Galino and Andre Mendes. This was another bout that went to the last round and Mendes got the nod from all the judges to claim the title. The Senior Novice 69KG final was a similar affair with the decision resting on the last round where David Giles (GMIT) eventually took it to claim a unanimous win over Alex Smirnov (TCD). The Senior Novice 72KG final saw another title go to GMIT when Jack McHugh took a unanimous decision win over John McLoughlin (BMC). In the Senior Novice 75KG final, Jean Pierre Kaluena (DKIT) took a unanimous decision win over Conor McGinn (DCU) despite a very strong last round from McGinn. In the Senior Novice 86KG final, Jordan Doyle (UL) dominated his opponent Ayo Bakare (GMIT) to take the title on a unanimous decision. The Senior Novice 91+KG decider was a classic between two big men. Taiwo Tibetan (GMIT) dominated the opening two rounds and even gave his opponent a count in the second but Mushin Nassir (TU Dublin) refused to give up and landed some huge shots in the final round to hand Tibetan a count. After three pulsating rounds, Tibetan got the decision from all the judges to bring another title back to GMIT. In the Youth 63KG final, Jack McGivern (BMC) used his vast experience to overcome Jack Gill (MU) and take the title with a unanimous decision. In the Youth 75KG final, Louis Browne (SRC) took a split decision win over Martín O’Donaicha (OFCFE) in a contest that saw big shots landed by both boxers. The Intermediate finals started with Eirinn Rocks (BMC) taking the 57KG title following a unanimous decision win over Kevin McGrath (TU Dublin). In the 60KG Intermediate final, Eoghan Chelmiah (ITC) took a 2-1 split decision win over Daniel Glavin (CIT). The Intermediate 63KG final saw Ryan McCarthy (CIT) and Martin Tolan (BMC) get stuck into an action packed contest from first to last bell. McCarthy took the unanimous decision win and Tolan made him work hard to earn it. This contest was followed by another classic when Mikey Keating (WIT) and Kieran McCole (DCU) faced off in the Intermediate 69KG decider. As with many of the really close bouts over the Championships, this contest came down to the last round and McCole shaded it in that last round to take a 2-1 split decision. The Intermediate 75KG final saw Euan McConnell (UU) facing Ronan Kelly (TU Dublin). Despite a strong showing from Kelly throughout, McConnell seemed to always have the upper hand and took the contest with a unanimous decision. The Intermediate final at 81KG proved to be another humdinger when Harrison Eghosa Igharo (DKIT) faced Danny Boyle (LYIT). With little to choose between the boxers over the first two rounds, Igharo shading the first and Boyle the second, it again came down to the last round. This round again was very close and the delay before announcing the decision only added to the suspense. Eventually, following a split 2-1 decision, Boyle was declared the winner and the title was going to Donegal. In the Senior finals, the Female 48KG final was up first and Ciara Walsh (ICFE) faced Emma Feeney (Cavan Inst.). This was a tight contest with Feeney doing enough over the three rounds to win unanimously and bring the title back to Cavan. The Senior 57KG final was an all University of Limerick battle between Chloe O’Keefe and Joanne Padden. After three rounds of boxing, O’Keefe came out on top with a unanimous decision win. In the Senior 75KG final, Shannon Reilly (Bray IFE) took the title following a unanimous win over Renee Roach (DCU). In the battle of the men at Senior 63KG, Terry McEntee (DCU) retained his light welterweight title with a unanimous decision win over Tadgh McGowan (GMIT). McEntee turned the screw as the rounds wore on and handed standing counts to McGowan in the final round as it looked like a stoppage may have been on the cards. Tadgh McGowan however held firm and saw the contest out. The Senior 69KG final for the men saw two seasoned campaigners take to the ring. Edgar Vuskans (QUB) and Michael Kinsella (UL) served up a treat for the spectators but Vuskans received two public warnings for losing his gumshield during the bout and this left him with a huge uphill battle to try to win the contest. The final result was a 2-1 split in favour of Kinsella much to the delight of his cornermen and supporters. Vuskans however can be proud of his showing on the day. The Senior 75KG final saw Bryan McNamee (LYIT) take a unanimous decision win over John Marshall in another cracking contest. McNamee received a cut to the head in the first but he didn’t let it interfere with his progress as he continued to stand close to Marshall and offload big shots. To his credit, Marshall matched McNamee in the punching department but the Letterkenny IT boxer had a little bit more when it mattered. Overall, a cracking contest. Please find attached the schedule of bouts for finals weekend. Unfortunately, the IABA are holding a full program of Senior Cadet boxing next Saturday, and a Central Council meeting will also be taking place meaning that officials will not be available for our Championships. We have been advised that parking will also be at a premium and thus, the IATBA Committee have decided to postpone the remaining finals until the following day, Sunday, March 10th. Friday night weigh-in is from 6pm-7pm (a 1KG allowance for evening weigh-in). **All finalists must weigh-in** The Senior 75KG semi-finalists must also weigh-in. Sunday, March 10th will conclude the finals and the weigh-in on Sunday morning will be from 8am-9am. **All boxers must weigh-in on finals day** No allowance givenBoxing will commence at 11am. VIDEOS/DVD’sAll contests at the 2019 IATBA Championships have been recorded individually by Michael Hade. Anybody wishing to purchace their contest should contact Michael at 087-7054399 or on facebook at Michael Hade or on the National Stadium Boxing Videos page. DVD’s of the bouts can be posted out or alternatively, bring a USB stick on the day of the finals and get your contest in a matter of minutes. Teams whom wish to pay outstanding fees may do so at the collection desk. Fees must be paid before boxers weigh-in. Team Leader/Coach must declare if any of their team has withdrawn from the championships. Boxers may then start to weigh-in. Boxer proceeds to the check-in desk and must present their student ID card and boxing record book for checking . Boxer deposits their record book and weigh-in slip at the registration desk. 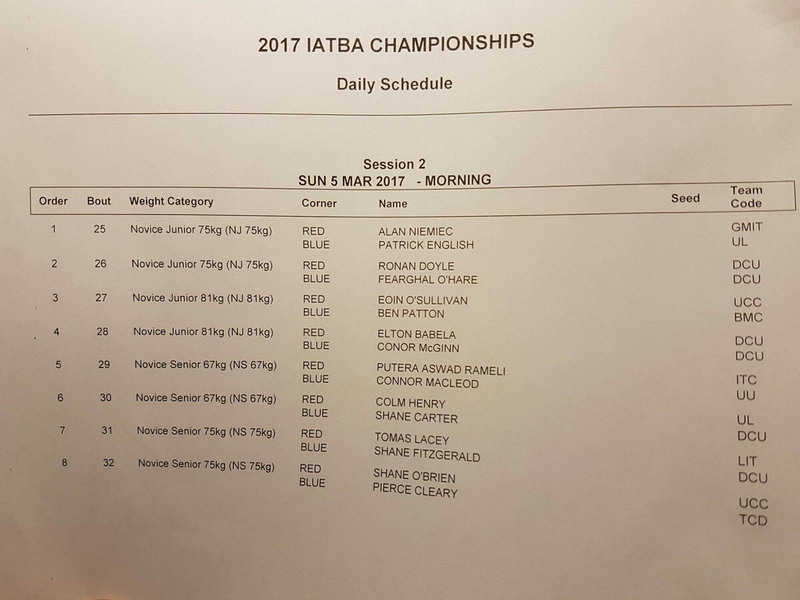 Draw sheets and order of bouts for 02 March will be published to the IATBA website; http://www.iatba.ie, as soon as possible after the draw. Boxers with long hair must keep it contained within the headguard with a hair net or bandanna. Boxers must present themselves clean shaven for weigh-ins and bouts, and advise details of any medication they are taking, or have taken in the preceding 4 weeks. Novices weigh in on first day and finals day. Boxers in all other categories weigh-in everyday that they box from 8:30-9:30 am. Coaches must wear tracksuits and trainers at all sessions, and endeavour to set a high standard of hygiene in the corners. All decisions must be accepted in a sporting manner. Seconds must collect their boxer’s record book from the top table right after the boxer has lost and the bout has been logged in their record book. Questions to the Supervisor’s table are not permitted unless absolutely essential – the top table must be able to concentrate fully on the field of play at all times. Checking of boxers’ record books by coaches or other boxers is prohibited – record books of boxers will be thoroughly checked by the organising committee to ensure that mismatches do not occur. Safety of all competitors is paramount. The Irish Athletic Third-level Boxing Association wish all students competing a very successful championships. Entries are now closed for the 2019 IATBA Championships. Regular online entries will close at midnight on 26 February 2019. Late entries will be taken up to midnight on 28 February 2019 at a higher fee of €40. Best to get entered on time and save your money! To complete the entry, two online forms must be completed. The first is the IATBA Membership Form for 2018/19 here. The second form is the actual entry form here. The Irish Athletic Third-level Boxing Association (IATBA) have selected a team of 11 boxers to represent the Irish College & Universities team at the 2018 Haringey Box Cup in the Great Hall of Alexandra Palace in north London from 22 -24 June. The Haringey Cup is celebrating it’s tenth anniversary year, having been established as one of Europe’s largest and most prestigious tournaments for club boxers. This is the fourth year that IATBA have selected a team for this event. The Irish Colleges & Universities team will comprise 9 male and 2 female student boxers, at both Elite and Developmental level, whom have performed with distinction at domestic and international level over the past season. Jason Clancy (left) alongside his brother Dean (European Youth silver medallist 2018). Dean will represent D.C.U ABC at Haringey Box Cup 2018. The curtain closed on the 2018 IATBA championships on St. Patrick’s Day at the National Stadium. There were 24 finals boxed across novice, intermediate and senior classes. Dublin City University retained their status as top student boxing team with four gold medals earned inside the squared circle, all be it with a less clear cut margin – reduced from the seven golds won in 2017. DCU ABC were also the only team to earn more than 10 contest wins over the course of the championships with 13, followed by University of Limerick with 8 and Cork IT and GMIT with 7 wins each. It was a much more competitive championships across the board with the medals shared between 22 different colleges. This speaks to the hard work and dedication being put in by boxers, coaches and committee members in colleges around Ireland and the support given to them by sports officers. Results and reports from the championships can be found at the links below. The 2018 Irish Third-level Championships conclude at the home of Irish Boxing, The National Stadium. There will be a cover charge of €5 on the door. There will be a special St. Patrick’s Day €10 dinner and dessert on offer in the Ringside Club from 1pm. If interested, let the organising committee know as soon as you arrive at the venue. Please come and support the finalists. The showpiece of Irish Third-level boxing will take place next Saturday, 17 March, at the National Stadium Dublin when there will be 28 IATBA championship titles up for grabs in a St. Patrick’s day finals showdown. The program will consist of 15 Novice, 2 Youth, 3 Intermediate and 7 Elite Senior finals. DCU Athletic Boxing Club will be seeking to retain their claim as Ireland’s premier student boxing club. UL Boxing Club, GMIT Boxing Club and CIT Boxing Club look best placed to usurp DCU and take that accolade. Every finalist must weigh-in at the High Performance Gym at the National Stadium between 8:00 to 9.30am. Boxing will begin at 10:30am sharp. Boxers are advised to allow themselves the appropriate recovery time after weigh-in to allow maximum performance in their finals contest. The 2018 Irish Third-level Student Championships continues with a program of 14 contests on Friday, 16 March, at the High Performance Gym, National Stadium, Dublin. Scheduled are 11 semi-finals in the Junior Novice, Senior Novice and Elite Senior divisions and three championship finals for Female Elite Senior at 51 and 57 Kg and one Male Senior Novice final at 75Kg. In the Female Senior 51Kg final Lois Smith (GMIT/Castlebar) will box Chloe O’Keefe (UL/Kanturk). In the Female Senior 57Kg final Kellie McLoughlin (Inchicore CFE/Drimnagh) will face Clodagh McComiskey (Southern Regional College/Holy Trinity). In the Senior Novice 75Kg final Danny Boyle (LYIT/Dungloe) will meet Paul Fitzgibbon (WIT). The weigh-in for Friday’s contests will be from 6pm – 7pm in the High Performance Unit. Due to the evening weigh-in there will be a 1Kg allowance for all boxers. Only elite senior division boxers and the senior novice finalists are required to weigh-in on Friday night. The programme for the second session of the 2018 Irish Third-level Student Championships is available at the link below. Please note that all novice boxers are not required to weigh-in. Intermediate and senior boxers must weigh-in at the High Performance gym at the National stadium between 8.00am and 9.30am. Boxing will begin at 10.30am, and 28 contests are on the schedule. The 8th FISU World University Boxing Championships will take place from Sep 01 – 06 2018 in Elista, Republic of Kalmykia, in the Russian Federation. All boxers participating in the 2018 FISU World University Championship must be born between 01/01/1993 and 31/12/1999. Each country is authorised to enter one competitor for each weight category. Each boxer must have a valid AIBA medical record book. The Irish Athletic Third-level Boxing Association (IATBA) are now inviting Senior Elite level student boxers, whom wish to represent Ireland at these championships, to declare their interest. Email iatba2010@gmail.com with the subject header “WUC 2018”. Boxers representing Ireland at the World University Boxing Championships must meet Student Sport Ireland’s eligibility criteria for international competition and the IATBA performance criteria. IATBA has previously selected a team for the 7th FISU World University Boxing Championships which were held in Chiang Mai, Thailand in October 2016. IT Carlow Boxing Club will host their annual club show “Showdown in the Barrow” on Tuesday 5th December. This show has consistently been the best organised college boxing show for the last number of years, highlighted by last year’s event, “Showdown in the Barrow 2 ” winning Student Sports Ireland’s event of the year 2016-17. The Irish Athletic Third-level Boxing association have supported the running of past events in a judging capacity and will be there again this year. Following IT Carlow’s most successful season in 2016-17, with several IATBA champions and silver medalists, their best boxers will be matched with student boxers from colleges and universities around Ireland. Boxers interested in competing at the event should complete the entry form at the link below and return it to the email addresses outlined on the form. One year on from the 7th World University Boxing Championships let’s take a look back at the event and Team Ireland’s exploits. The 7th FISU World University Boxing Championships were hosted by Chiang Mai University in Chiang Mai, Thailand, in association with FISU (International University Sports Federation), the University Athletic Association of Thailand, the International Boxing Association (AIBA) and the Thailand Boxing Association. The championships attracted participants from 19 nations, exclusively from Europe (13) and Asia (6). There were 100 boxers – 80 males and 20 females. This was the largest athlete entry since the inaugural championships in 2004 hosted by Antalya, Turkey which welcomed 127 boxers from 27 nations. The 2004 World University Championships was also the only previous occasion when Irish boxers entered. Ireland were represented by Eamon O’Kane and Cathal McMonagle. The 2016 World University Boxing Championships Irish Team was the first team selected under the aegis of the Irish Athletic Third-Level Boxing Association (IATBA), since the association was founded in 2010. The Team Manager nominated five eligible student boxers whom had achieved the selection criteria above to be considered for selection for the World University Championships by the Student Sport Ireland High Performance Committee. The SSI High Performance Committee, aided by the selection criteria outlined above, and the student nomination forms submitted, reviewed each student boxer nominated and ratified all five for participation at the 7th FISU Boxing World University Championships. The boxers mainly trained with their club coaches at home in their own clubs. The boxers selected were initially informed of the possibility of Ireland entering a team for the World University Championships in March 2016. In the meantime, Céire Smith and Christina Desmond trained with the Irish High Performance Unit in preparation for the European Olympics Qualifier Tournament in Turkey in April and the AIBA Women’s World Championships in May 2016. Both women were unfortunate to miss out on Olympics qualification. Kenneth Okungbowa was producing the best form of his career in winning gold medals in both the Haringey International Box Cup in London in June (representing IATBA) and the Celtic Box Cup in Dungarvan Co. Waterford in September. Gary McKenna also won a silver medal for the IATBA team at the Haringey Box Cup. Conor Wallace also secured a silver for IATBA at that tournament. Conor Wallace also had the unique opportunity to be selected by Irish UFC MMA fighter Conor McGregor to be his sparring partner for his training camp in preparation for his ultimate victory over Nate Diaz. Conor trained in Las Vegas for 7 weeks before the showdown on August 20th. Conor had previously been involved in the Irish Elite teams training camp in Azerbaijan in June. The venue was the Chiang Mai University Convention Center (CMUCC), built in 1997. The building offers seating for 3,500 persons and floor space of around 1,500 square metres for the field of play for the boxing competition. This was also the venue for the opening and closing ceremonies of the championships. As the CMUCC is also a theatre venue the acoustics of the building were particularly striking. The organisation of the championships were beyond expectations. Every team’s delegation was assigned a liaison team comprising students from Chiang Mai University. The size of these teams was dependent on the size of the delegations. The Irish Team delegation comprised four students for the first two days and the two for the remainder of the event. The liaison teams were the conduit for information between the organizing committee and the delegations. Our liaison team met us at the airport, organized the transport to the hotel, gave us a tour of the facilities and venue, helped us exchange currency and informed us of all duties we had to perform each day every morning. Information was passed along to the team in a Facebook group in which the Irish Team and our liaison team were all members. Our liaison team was most helpful throughout the event and had excellent standard of English as they were studying English at CMU. The facilities at the hotel and venue were excellent, including the layout of the medical rooms where 24-hour medical service was available from staff from the Chiang Mai University Hospital. Also, the weigh-in facility, officials’ room, technical room etc. were excellent and there were two boxing rings and five free-standing punch bags in a temporary competition training area set-up in the basement of the hotel residence. Three meals a day were offered in a large dining room at Uniserv CMU. The meal windows were large allowing the delegations ample time to eat all their meals allowing for the differing daily schedules. The food and drink were of a high standard, fresh and nutritious, and the staff were very friendly and helpful. Every effort was made to ensure that the participants were comfortable. Conor opened up the competition for Ireland in the third bout on day one against Valerii Kharlamov of Ukraine in a preliminary bout. Kharlamov had previously boxed in the AIBA World Championships and for the Ukraine Ottomans in the World Series of Boxing. Wallace began brilliantly, flooring his opponent in the opening round with a big left (for what would be the most impressive knockdown of the whole championships) and taking the lead on the scorecards. Disaster would then strike in as Wallace suffered a nasty cut over his eye, seemingly via a clash of heads. With the scores level 19-19 Coach Paddy Gallagher brought a halt to the bout at the end of the second round to prevent any irreparable damage being inflicted, and therefore a technical knock-out win was awarded to Kharlamov. Conor can count himself very unlucky, as had the referee and ringside doctor stopped the bout during the second round rather than the coach at the end of the round, Wallace would have been awarded the win on the scored-cards via technical decision. Nevertheless, due to the severity and placement of the gash, Conor’s participation in the quarter finals would have been impossible. Following this TKOI win for Kharlamov, the Ukrainian stormed to gold, defeating Taiwanese fighter Chin-An Yeh (30-27 x3), Frenchman Bengoro Bamba (29-27 x 2, 28-28) before a win in the final over Russian Artem Garashchuk. The gash on Conor’s eye required stitches which were removed after four days. The medical care was top class from the on duty medical team throughout the championships. Gary McKenna opened his competition in a high-tempo duel with Temirian Osmonov of Kyrgyzstan over three, three-minute rounds in the 60Kg lightweight class. The evasive Kyrgyz connected with some slick shots throughout, while Gary constantly took the fight to his opponent and detonated some big punches off both hands throughout and going down the final stretch of a see-saw encounter. The verdict was a 3-0 score line for Osmonov. The judges scored the final round to Gary 2 to 1 but had already awarded his opponent the first two rounds. Gary, personally had thought he had done enough to win, however the result was not in question. Osmonov fought a very sharp and controlled bout and done what he needed to do to win. Céire Smith began her World Championships against French No. 2 Wassila Lkhadiri in the flyweight 51Kg division in the quarter-finals on the third day of competition. Smith, aiming for a semi-final meeting with Japan’s Sano Kawano and a guaranteed bronze medal, lost to Lkhadiri in the flyweight category over four two-minute rounds. The multiple time Irish Elite champion held her composure in the face of Lkhadiri’s constant aggression in the first two rounds of the bout, finding the target with well-timed combinations, but eventually bowed out on a split decision 2-1. Céire was disappointed with her performance and felt she could have done better, but despite her best effort the necessary strength and energy just wasn’t there on the day against an opponent she had bested in sparring matches in Ireland’s High Performance Boxing training camps in Dublin. Christina Desmond, on day 2 of the competition, made history after becoming the first ever Irish boxer to win a medal at the World University Boxing Championships. Christina won her quarter-final comprehensively 3-0 against Kazakhstan’s Zura Kussainova to guarantee at least bronze, and secured her first major senior international medal. She had previously won World silver and EU bronze at Youth level. Afterwards Christina declared that she always felt in complete control during the bout and was looking forward to the semi-final. Christina took on Poland’s Natalia Hollinska in the semi-finals in Chiang Mai but lost out despite a huge performance. Boxing out of a southpaw stance, Desmond immediately found a home for her backhand left and looked physically much larger and stronger in the opener, winning 10-8 on one of the three cards. Hollinska upped her work-rate in the second and began to pressure Desmond. While the Irishwoman landed some quality shots and showed some good footwork, the Pole was certainly growing into the bout and starting to land more punches. While Desmond had scored a comprehensive win over Kazakh Zura Kussainova in the quarter finals, Hollinska received a bye straight into the semis, and it showed as Tina seemed to be tiring in the third round. Needing a big fourth and final round, Tina summoned a huge performance to score some with heavy shots, although Hollinska was still the busier boxer and was given the decision following a crucial, and one might even say undeserved, point deduction awarded against Tina for holding. The final scorecards read 37-37, 37-38, 37-38 to give Hollinska a majority decision win. However, Christina can be very proud of the fact that she had made history in securing Ireland’s first ever medal at this level, and she had left everything in the ring against an older and more experienced opponent. Christina was presented with her medal on the final day of competition. Just hours after Christina Desmond secured Ireland’s first ever medal at the World University Championships on day 2 of the competition, Athlone IT heavyweight Kenny Okungbowa had followed it up with another guaranteed bronze medal after a brilliant performance. The Westmeath boxer was not to be denied against the very experienced Tadas Tamasauskas (Lithuania) to book his place in semi-finals and ensure that he would fly home from Chiang Mai with a medal around his neck. A cut, which would require frequent attention, opened up to the side of Baltic boxer’s left eye in a wild opener, where Okungbowa seemed to land heavier shots on the inside, shaking the Lithuanian once or twice. A quieter second saw Kenny the more aggressive, while Tamasauskas sought to counter punch and had a degree of success. Both boxers were tired in the third round, but it was Okungbowa who was again the man pressing and looking to come forward, and he solidified his claim for the round in a hell-for-leather final thirty seconds. Neither boxer looked confident of victory after the final bell, but Okungbowa had his hand raised on a split decision to a chorus of cheers from his Irish team-mates in the crowd. After the bout, Kenny needed medical treatment for two nicks on both eyelids which looked to be as a result of shoulder bumps from Tamasauskas when he was holding at close range. The cuts were described as superficial by the medics, but would require paper stitches. In the semi-final, Kenneth was beaten by France’s Dylan Bregeon in a 91kg slug fest. Neither man had to go looking for each other, with Kenneth twice needing attention from the ringside medic in the first round for wounds to his eyelids sustained in his quarter-final win. Bregeon’s jab proved to be his most effective weapon, while Okungbowa found the target with the majority of the power shots throughout the three rounds. The 2015 Irish Elite finalist went for broke going down the final stretch, backing his opponent up against the ropes, but Bregeon smothered the attacks and took the victory. The 7th FISU World University Boxing Championships were a great success for the Ireland team as the team took home our first medals at this level, two bronze medals for Christina Desmond and Kenneth Okungbowa. The team can be immensely proud of their performances over the week of competition. On another day, and with other referees and judges on duty, the rewards may have been even better. The boxers themselves spoke of their gratitude for the opportunity to represent their families, clubs, colleges and country at the highest level of university boxing. The consensus was that Thailand was a wonderful country and hopefully not a once in a lifetime trip. All the boxers and Coach Paddy Gallagher were adamant that the organisation of the championships was excellent, and that it was the best run international boxing competition they had attended, exceeding AIBA World Championships and EUBC European Championships. The objective of the IATBA is to build on the success of these championships and deliver even better results at the 8th FISU World University Boxing Championships in Elista, Russia in 2018. The Irish Athletic Third-level Boxing association have selected a team of 12 boxers to represent the Irish College & Universities team at the 2017 Haringey Box Cup in the Great Hall of Alexandra Palace from 16 -18 June. The Haringey Cup is celebrating it’s tenth year in existence, having been established as one of Europe’s largest and most prestigious tournaments for club boxers. The Irish Colleges & Universities team will comprise 7 male and 5 female student boxers, at both Elite and Developmental level, whom have performed with distinction at domestic and international level over the past season. The 2017 Irish Athletic Third-level Boxing Association Championships will draw to a close Saturday March 11 with 19 finals scheduled at the home of Irish boxing, The National Stadium, starting at 11 a.m. The first bout is in the Junior Novice cruiserweight class (86Kg) as Niall McCarthy (UCC) faces Finbarr Maguire (Cork IT). McCarthy, who claimed two All-Ireland hurling medals with Cork and an All-Star award during a storied inter-county career, has in recent times taken up boxing with St Colman’s BC in Cork, and looks to be taking well to the real “toughest trade”. Will CIT’s Maguire deny him another All-Ireland Title in this all-Cork battle? Cork IT are also represented by 2017 Irish Novice Championships finalist Ian Kelleher in the Senior Novice lightweight final, where he boxes Eoin Meaney (UL). There are two all Dublin contests at Junior Novice 64Kg and 67Kg where Aaron McGuigan (ITT Dublin) faces Conor Harte (DCU), and André Mendes (ITT Dublin) faces Jack Matthews (Monkstown/IADT). In the lone female final at Senior 60Kg, Rivers McCormack, coming off a big confidence boosting win against Irish Senior (formerly intermediate) champion Saidhbh Greene in the semi-final, faces another multi-Irish title winner in Louise Donohue (Geesala/IT Sligo). Gary McKenna, whom represented the IATBA’s Irish student team at last October’s World University Boxing Championships in Thailand, will meet Jason Kirwan (UL) to determine the champion in the Senior 60Kg division. The Senior 64Kg final will be an all Ulster battle as Niall McAlinden (Holy Family GG/Ulster University) goes head to head with Matthew Murnion (St Bronagh’s/Queens). The 81Kg final is another provincial derby as former Irish Intermediate champion from Galway, Ryan Dervan (NUIG), meets Mayo’s James Daly (GMIT). In the final bout of the championships, World University Championships bronze medallist Kenneth Okungbowa (Athlone/AIT) will square-off with Cian O’Shaughnessy (Rathkeale/NUIG) at Senior super heavyweight. Saturday’s finals promise to be the best days programme in the 8 year history of the IATBA, so everyone should try to get down to the Stadium and support all the student boxers who have put huge effort in all year to win an Irish Intervarsity title. Admission is just €5. The finals of the 2017 Irish Athletic Third-level Boxing Association Championships glove-off at Irish Boxing HQ, the National Stadium, at 7:45 pm on Friday March 10th with seven contests up for decision. In the Senior Novice class, there can be only one IATBA champion, as Ulster University’s Connor MacLeod faces Shane Carter of DCU ABC in the 67Kg decider. Both boxers looked in fine form in their respective semi-finals so a close contest can be expected. DCU are again represented at 71Kg where Solomon Simon takes on David McVicker from Belfast Metropolitan College’s Boxing Academy in a straight final. At clash of styles will make for an exciting bout at 75Kg Senior Novice where last year’s Junior Novice champion Shane O’Brien (UCC) faces Shane Fitgerald (DCU). O’Brien’s athletic, aggressive go-forward style saw him reach the Irish Novice 75Kg final in January where he just lost out on a split decision. He’ll be hoping to go one better this time against Fitzgerald, whom adopts more counter punching tactics. Potentially fight of the night. In the lone Youth class final at 64Kg, the 2017 Irish Novice champion Conor Jennings (St. Monica’s Newry/SRC) meets the talented Kenneth Doyle (Sallynoggin CFE) from Dublin’s Monkstown club . The Intermediate 75Kg final sees UL’s Dean Griffen oppose DCU’s John Marshall, one of the north Dublin University’s 9 IATBA finalists. IATBA veteran Fionnbarr Thompson (Southside BA/UL) will box Patryk Adamus (Drimnagh/Inchicore CFE) for the Intermediate 60Kg title. Thompson is seeking his third IATBA title since 2013. The final bout of the night features a DCU boxer once more as Jack Robinson goes against Monkstown’s (via Bantry) Séamus Lyons. A great night’s boxing is guaranteed so please come do come along and support the boxers. Admission is €5.. Note to competitors: Weigh-in for all boxers from 6:30 – 7:00 pm at the Stadium. Boxers must be clean shaven. There are seven finals scheduled for Friday 10 March. Weigh-in for all boxers from 6.30 – 7 pm. Boxing to begin at 7.45 pm. Boxers must be clean shaven. Boxing to start at 11am. No weigh-in tomorrow morning as all contests are Novice class. Novices weigh in on first day and Finals day. Boxers in all other categories weigh-in on day they box from 8:30-9:30 am. Elite: Male and Female Competitors between the ages of 19 – 40 years old in 2017. Youth: Male and Female Competitors aged 17-18 years old in 2017. 1. Competitors must be Elite Boxers, born between January 1st 1977 – December 31 1998, or Youth Boxers, aged 17 – 18 years old in 2017; born between January 1st 1999 – 15 January 2000. 2. Competitors must be fully registered and hold a student card for the institution with which they are internally registered for the current academic year. 3. Competitors must be currently pursuing a course of study that leads to an award ranked at a minimum of Level 6 up to Level 10 on the Quality and Qualifications Ireland’s (QQI) National Framework of Qualifications, or minimum Level 3 up to Level 8 on the Northern Ireland National Qualifications Framework. Note: The Junior Novice Category is intended for Competitors that are in boxing for no more than a year. Competitors that are in boxing between 1 and 3 years, and have less than 13 bouts must compete in the Senior Novice Category regardless of the number of bouts on their record book. This is to ensure that Boxers with more sparring experience do not obtain an unfair advantage over less experienced Boxers. All Novice Competitors must include their date of registration on the Competition Entry Form (this will be checked at registration). • Competitors must produce their Boxing Medical Book and their valid Student Identification Card for the current academic year. • Entries are subject to vetting and it is a condition of entry that all competitors and officials shall have signed the IABA Waiver / Members Acknowledgement Form. Important – Entries will only be accepted once approved by the third-level institutions’ Sports Officers / Students Services Staff member. Boxers can only compete with the permission of their academic institutions’ sports officer or equivalent. Competitors must have one Red and one Blue Vest. Coaches must wear tracksuits and trainers at all sessions, and endeavour to set a high standard of hygiene in the corners. Novice Males and all Females competitors must wear headguards. Competitors with long hair must keep it contained within the headguard with a hair net or bandanna. Gum Shields: Red, Orange or Pink coloured gumshields are forbidden. Any competitor entering the ring with either colour gumshield will not be allowed to box and a walkover to their opponent will be called. Sportsmanship: All decisions must be accepted in a sporting manner. Entries are made via the online entry form. The closing date for entries is Tuesday, 28th Feb 2017. Third-level institutions entering Competitors for IATBA Championships must pay a membership fee of €100 to the IATBA for the year. Once entries are received from students, the College’s Sport Officers / College Boxing Team Officials will be contacted by IATBA to organise membership payment as soon as possible in order to facilitate the administration of the Championships. Competitor entry fees are requested to be paid before the closing date, preferably by bank transfer.